No, I didn't ask for a bigger screen for the Apple Watch. On my wish list were more battery, wrist gestures, independence from the iPhone and sleep tracking. All things that would make the Apple Watch a better wrist computer. I've been very satisfied with the Apple Watch as a watch since the very first version. In my review of the first Apple Watch in 2015, I was amazed by what a great digital watch it was and how much attention was paid to tiny details that only watch fans would notice. I didn't like it as much as a wrist computer and fitness tracker. With the second and especially the third Series, the Apple Watch became a much better wrist computer and fitness tracker. As a watch it remained - apart from a few new bracelets and one or two new dials - good and fascinating. Now with the fourth Series, Apple has once again turned its attention to the watch aspect. There are also new functions and technologies, but more about that later. The biggest change compared to the predecessor concerns the Apple Watch as a wristwatch. First of all there is the new design. The watch is minimally larger and has a significantly larger and above all nearly frameless screen. The latter is the big highlight of the new watch. It was clear after the iPhone X was announced that such a screen would come to the watch at some point. But the fact that it makes the watch so much more beautiful only becomes apparent when you wear the new Apple Watch. Apple masterfully camouflaged the comparatively small screen in the early watches. Lots of black and no elements at the edges made you think the screen was much bigger. Only when you looked at photos on the watch (and who does?) did you notice how tiny the stamp-sized screen was. The small rectangle didn't fit the design of the rest of the watch with its many rounded edges. Now with the new screen, the watch looks even less like a gadget than it already did, and more like a wristwatch. Personally, it constantly reminds me of the futuristic Ressence watches. The second improvement concerns the case. It's a bit longer and wider, but also thinner. If you place the new and the old watch next to each other, you get the feeling that the new one is significantly bigger. On the wrist, an old wisdom of buying a watch proves true: Always try it on first. Size and weight specifications can be deceiving. When I had the opportunity to try on the watch briefly after the presentation in Cupertino, I wasn't sure whether it was an illusion: although it was bigger, the new Apple Watch felt smaller, lighter and more comfortable on the wrist. Now, after almost a week, I'm sure it wasn't an illusion. The new Apple Watch is much more comfortable to wear on my arm and, above all, doesn't wear as high. By the way, the new design doesn't mean that wristbands bought earlier won't fit anymore. Here Apple had a heart for customers with a large collection of wristbands. But it would also have been risky to introduce a new wristband system. The easy to change wristbands were one of the early trump cards of the Apple Watch. In the meantime, there is a whole ecosystem of manufacturers who produce bracelets in all materials and price categories for the Apple Watch. It is inevitable that Apple will one day launch a new wristband system. But may the day be far away! The new software also brings new functions for older Apple watches. Only the very first generation will no longer receive the update. Fitness duels: How did I miss the function of my Fitbit. Now you can finally challenge your friends to a duel on the Apple Watch. Whoever has reached or even exceeded their fitness goals most reliably in the course of a week wins. Rearrange the buttons in the control center: Finally, it is possible to place the buttons in the control center as you would like them to be. In my case, I can finally push the "Find my iPhone" button all the way down. Not that I accidentally hit it again late at night instead of the "Don't Disturb" button and wake up half the family with the ringing. Automatic Sports Tracking: How annoying, if you only notice halfway through the jogging session that you haven't activated the tracking and possibly lost valuable points in a fitness duel. With watchOS 5, the watch automatically detects when you're exercising and especially when you're done. To be on the safe side, the watch always asks you. Not that it screws up the statistics. Walkie-talkie: This mini messenger turns the Apple Watch into a walkie-talkie. At the touch of a button you can send short audio messages. That's a funny gimmick. But it only works with friends who also have an Apple Watch. Raise your wrist for Siri: If you hold your watch in front of your mouth, you don't have to say "Hey Siri, Timer 5 minutes" anymore. It's enough: "Timer 5 minutes." Theoretically. In practice it still doesn't work very reliably. Neither on an Apple Watch of the third generation nor on the very latest one. Here Apple should still make some improvements. Because the idea is great and much better than a microphone that is always on and waiting for "Hey Siri". If you still find the function uncanny, you can switch it off in the settings. Another highlight of the new case is the redesigned crown. It now has a fine red circle instead of the red dot many criticized last year. Not only does this look much more discreet, this change was also necessary to make an ECG possible (more on this later). But the crown not only looks better, it also feels better. Apple has integrated haptic and acoustic feedback. When you scroll through menus, you feel and hear that. The illusion is so good that you no longer have the feeling of turning a freely rotating wheel. It feels like there are gears and springs hidden somewhere. In fact, it is "just" a very clever combination of sound and haptic feedback. The so-called Taptic Engine is responsible for the latter. A small metal pin is thrown magnetically back and forth and generates precise vibrations. This technology is also used for the silent alarm clock and all notifications. It was one of the best features of the first Apple Watch, along with the easily changeable wristbands. One last innovation on the case concerns the back. There is a new pulse sensor. It's not only supposed to be better, it's also been beautifully packaged. The back of all models of the new Apple Watch is now made of ceramic, and the sensor is under sapphire glass. 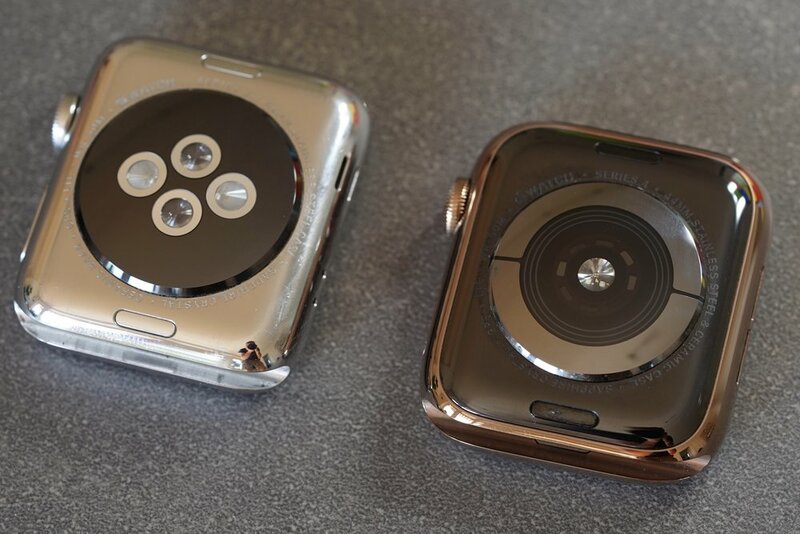 In earlier generations of the Apple Watch, the cheaper aluminum watches sometimes only had a case back made of a kind of plastic or, as Apple calls it, composite material. Apropos ceramics: With the fourth generation there is no luxury edition of the Apple Watch anymore. In the first generation these were the gold watches, in the following Series they were the ceramic models. Do these premium versions only take a break, or were they discontinued? Nobody in Cupertino could or rather wanted to tell me that. Since the Apple Watch hardware and software flow smoothly into each other like with no other Apple product, the new dials must also be included in the design section of this review. During the first few days with the watch, two of them were particularly notable. On the one hand there are the photorealistic dials that show fire, water and coloured dust. They are an eye-catcher on the large screens. A little detail on the side: These are not computer animations. Apple built larger metal models of the watch case. In there, for example, they ignited fire and filmed the whole thing. The second dial that deserves special attention is the Infograph dial. This looks intriguingly overloaded in the advertising photos. But in fact it is much more than just a dial. It is a dial generator. Because each of the numerous complications (the little info bits on the dial) can be individually selected and above all deactivated. This allows you to design much simpler and more elegant dials. Even classic watch designs can be reproduced. For example, the Panda dial with three black circles on a white background, which is popular with watch fans. All these improvements and innovations make the fourth Apple Watch an even better watch and the biggest update since the first generation. But what about the Apple Watch as a wrist computer and fitness tracker? There are also plenty of improvements here. In addition to the new pulse sensor, fitness fans can enjoy new software functions with watchOS 5 such as competitions (see box). The ECG function is very promising. It provides information about heart health. In a doctor's practice this is even more precise, but in a watch it is always at hand. Unfortunately, the ECG function is only approved for the USA, and it will probably take at least until next year before it comes to Switzerland. But also in the USA it will only be activated in the next few months, because the software is not quite ready yet. Nevertheless, I could already try the ECG function in Cupertino. One opens the appropriate App and must then only hold the finger approximately 30 seconds on the crown. By the way: Thanks to this sensor in the crown, the controversial red dot has disappeared. In the next days and weeks, when the initial euphoria and testing is over, the numbers should rise. But the battery values are still not record-breaking. That might also be the reason why Apple itself still doesn't offer sleep tracking. After all, you have to charge the watch overnight. Also a Always-on-screen should not come too soon because of the battery. I help myself with having an old Apple Watch as a night watch and a new one as a day watch. When I come home after work, I simply change the watch on the charger. So I always have enough battery and can even measure my sleep. If I forget to change the watch, I easily have enough battery for another half-day. The cheaper option would be to charge the watch before going to bed and in the morning during shower and breakfast. This way it's good enough for one day - and you don't need a second watch. After 30 seconds you get your ECG. It remains to be seen how easy it will be to read and how useful it is in everyday life. But it's already technically impressive and a strong marketing argument in the battle against the scattered competition. I have not yet been able to try out this second health function: The Apple Watch is supposed to offer help in case of falls as well as call for help automatically if you can't respond anymore. By the way, the function should also detect bicycle falls. It remains to be seen how useful this fall aid is. But I have the feeling that one year from now we will see a video at the presentation of the next Apple Watch of people who have been saved by the function or who at least have been helped after an accident. As a third point, we come to the new Apple Watch as a wrist computer. The fact that this is the last one to come in my review clearly shows what role the Apple Watch plays in my everyday life. First and foremost it's a watch, second it' s a fitness tracker, and third it's a mini mobile phone on my wrist. As far as this aspect is concerned, there has been little improvement this year. According to Apple, the battery should again last from morning to evening (18 hours). In my experience of the last days, the battery was at about 40% before going to bed and at 20% when I was on the road a lot without a connected smartphone with LTE activated. Other small improvements and changes are also welcome, but not very noticeable. The loudspeakers are now bigger and louder, which is handy when making phone calls. But since I hardly use the watch for phone calls, I was also quite satisfied with the old loudspeakers as well. The leap from the third to the fourth generation is the biggest the Apple Watch has made since its presentation in autumn 2014. It is now an even better fitness tracker, an even better wrist computer and above all an even more fascinating wristwatch. As a fan of mechanical watches, I can't help but be amazed by the dedication and attention to detail that the watchmakers in Cupertino have shown once again. One evening during the test, it happened to me that I forgot to put on my mechanical watch, which I wear 24 hours a day on my second wrist. To bathe Junior 2, I only took it off for a short time. It was not until the next morning that I noticed that it was missing. Would a life with only one watch - an Apple Watch - be possible? I can't imagine it yet. But the fact that I as a fan of mchanical watches did not miss mine for twelve hours should not only make me think. This is the translated version of my review I published a few hours ago in the Swiss newspaper Tages-Anzeiger.